I am not a trainer but I use this app to keep track of multiple sampling sites for agricultural field testing. The multiple timers allow me to record the time between samples taken at different places in the field multiple times a day with a single tap, and the CSV export allows me to easily get the data into excel for further processing. No more clip boards and sheets of paper flapping in the wind! It’s so easy to use. Definitely recommend for anyone needing to record the time or duration of multiple repeated events, in any application! 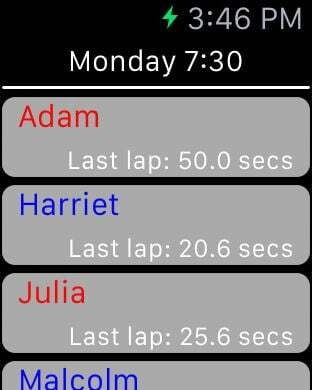 Used this lap timer for a running session for a group of triathletes, we set up different rests for different athletes and set them all off. The app worked very well, last split available when they compete that lap. All their splits available at the end of the session. Will use again. App scrolls so you can add plenty of athletes. App does flash up the name of the athlete when their rest time is over. This is an Interval or Circuit Lap Timer app to record lap times and calculate daily averages for groups of athletes, swimmers, cyclists, sprinters etc with the ability to allow for a defined rest period between laps: the end of the rest period for an athlete is signalled to the coach by an audio-visual alert, even while the app is in the background. The coach can then advise the athlete to start the next lap and tap the appropriate start button when the athlete starts. This app has an interface for starting and stopping the athletes on an Apple Watch if present (iOS9+ and WatchOS2.0+). Setting the rest time to 0 enables split-time recording: each press of the End Lap button records the lap time but does not stop the timer. Tapping the Stop All button 'stops' all athletes. Total time is displayed in this mode. The app handles metric or imperial distances and optional pace calculations. All group members can be started at the same time or individually. Unlimited groups of athletes and athletes within each group are possible. Multiple groups can be on the go at the same time. The current day's lap times and averages for a group or an athlete's past lap times for a specific day can be emailed in CSV (comma-separated) format for easy loading into a spreadsheet program such as Numbers (including on iDevice), Excel, OpenOffice, LibreOffice etc. The fifty most recent daily average lap times are shown alongside the current day's average lap time and lap information: lap time and optional pace - minutes per km or minutes per mile. 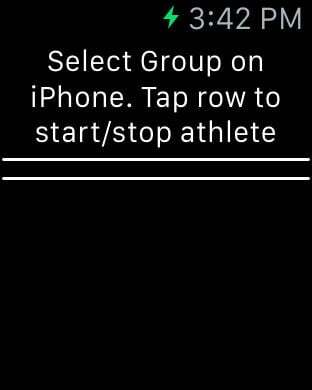 Each athlete in each group can have a different lap length and a different recovery period - double-tap the athlete in the group list to modify the athlete’s lap length and recovery period. Notification of the completion of recovery period occurs even while this app is in the background. A group can be cloned or deleted. There is an optional 5, 10 or 15 second countdown timer when an athlete is due to restart to allow the coach to count athletes down to their restart. There is an option to split athletes into two subgroups: those who have started and those who have stopped. The order of the athletes - if not split into two groups - can be rearranged. There is a 'Race Mode' feature on iPad: this provides a way to start multiple groups at the same time and/or start athletes individually, and then see them all and stop them as they finish. Started and stopped athletes are split into two groups for easier management. All results are archived and the most recent fifty days' sessions can be viewed, modified and emailed at any time. This app can also be used by individual athletes to monitor their own progress.